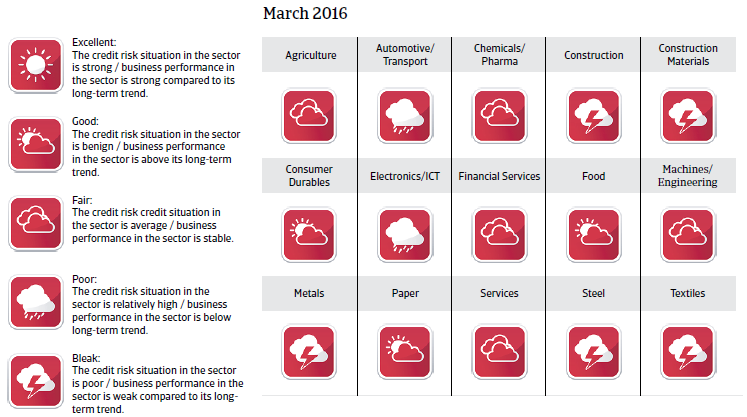 Despite major economic reforms growth remains subdued and inflation very high. In November 2015 the former mayor of Buenos Aires, Mauricio Macri, won the run-off election for presidency against Daniel Scoli, the candidate of the government coalition. Macri’s campaign was supported by a coalition of mainly centrist non-Peronist parties, called ‘Cambiemos’ (Let´s change). He advocates a more liberal, business friendly economic policy than his predecessor. However, while Cambiemos gained more seats in the October 2015 general elections, it still lacks a majority in the Chamber of Deputies and the Senate. This means that Macri has to cooperate with the opposition in order to assure parliamentary majority for structural reforms. The economic policy of former President Fernández de Kirchner was characterised by interventionist measures and very expansionary fiscal policies, which have undermined government creditworthiness and resulted in accelerating inflation and capital flight. Argentina went into sovereign default in July 2014, after the government failed to secure a settlement with litigant hold-out creditors in line with a US court ruling. That meant that the country continued to be shut out of global capital markets. The debt default, subsequent deepening of interventionist policies and mounting economic problems in Brazil and in Venezuela have exacerbated the economic problems since 2014. 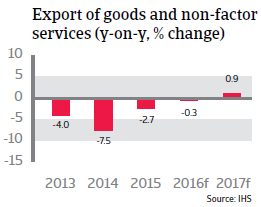 In December 2015 the newly elected President Macri took measures for an economic policy turnaround by abolishing export taxes on some agricultural products, reducing the levy on soybean exports to 30% and lifting currency controls, allowing the overvalued Argentinian peso to float freely. This triggered a depreciation of the peso of more than 30%. The new administration has also successfully negotiated with hold-out creditors in order to close a debt deal, which could lead to renewed access to international credit markets. 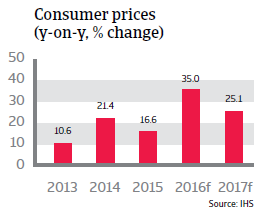 While the sharp peso depreciation helps exporters, it has led to an increase in the already high inflation rate, which is expected to rise 35% in 2016. In December 2015 the Central Bank raised interest rates on short-term fixed deposits by 8%, to 38%. Another increase in order to stabilise the peso and to contain inflation cannot be ruled out. Another issue is the need to tackle public finances. These have deteriorated due to the expansionary fiscal policy in the past and the monetisation of the fiscal deficit to compensate for the lack of access to capital markets. The new government stated it will phase out subsidies in order to trim the deficit. 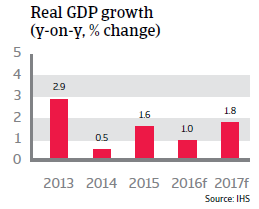 However, this could hurt the already feeble economic growth, given that the highly expansionary fiscal policy was the main driver of growth in the recent past. Moreover, this could also lead to social unrest. It remains to be seen how much the abolishment of export taxes and currency depreciation really help to boost exports and to increase the amount of (still depleted) foreign exchange reserves, given that global demand for agricultural products has decreased and prices are expected to remain low. Official reserves are still insufficient to cover the external refinancing needs. For the time being, the risk of uncontrolled currency volatility and transfer and convertibility risk remain high, given tight liquidity and the continued lack of access to international capital. High inflation and fiscal austerity measures could even lead to an economic contraction in the short term. 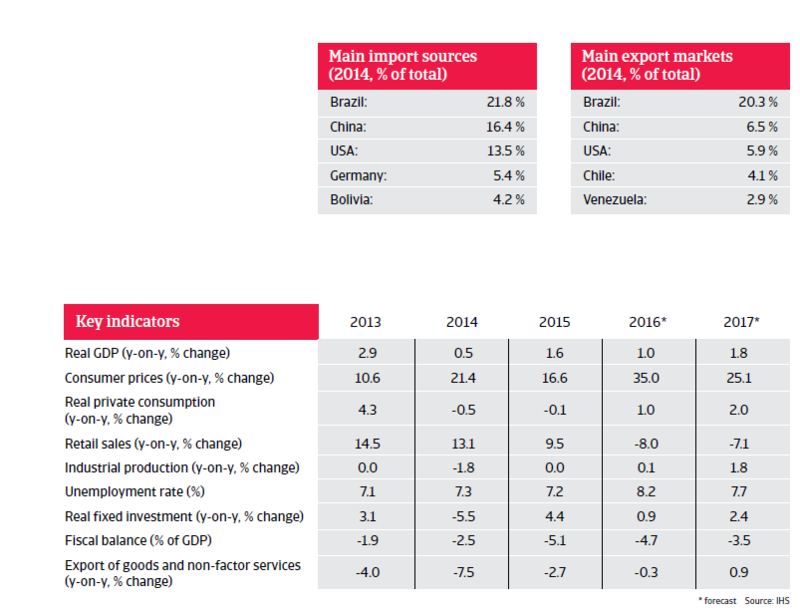 Due to Brazil’s economic slump and problems along the whole domestic automotive value chain we expect both payment delays and defaults to continue to worsen markedly in the coming months.